Red Lodge, Montana, is the perfect destination for you and your family’s next cross country skiing adventure; whether you ski groomed or backcountry trails, your first touring experience here is probably not your last. 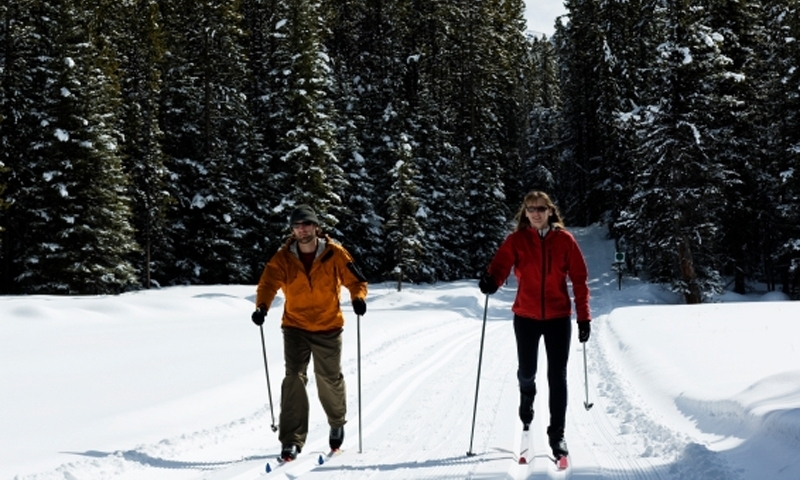 Red Lodge Nordic Center is perfect for families wanting to enjoy a picturesque day skiing or snowshoeing during hours of operation, 8:30 am to 4:30 pm from about November 30 to March 30. There are also a number of other plowed and backcountry trails near Red Lodge to enjoy cross country skiing. There are few better, more healthy, or otherwise fulfilling ways to explore and to enjoy the outdoor Winter wonderland of Red Lodge, Montana, than on cross country skis. Red Lodge Nordic Center, tucked at the Beartooth Mountain base, only three miles from Red Lodge, features 15 kilometers of groomed trails through open meadows and rolling loops through Aspens. RLNC is perfect for families wanting to enjoy a picturesque day skiing or snowshoeing during hours of operation, 8:30 am to 4:30 pm from about November 30 to March 30. RLNC also offers activities for non-skiing kids, maps, a snack bar, and cross country skiing lessons on site. RLNC trails are groomed weekly; Four trail kilometers are rated easy, seven are difficult, and four are very difficult. Take a look at the Grooming Report. To get to RLNC, follow Highway 78 to the one-mile marker, turn left heading west, toward the Fox and Smith Roads intersection, turn Right at the RLNC sign, park about ½ mile later, and sign in/pay at the kiosk. West Fork Road, with 8 easy, frequently groomed miles ending at a seasonal barricade (approximately December 1 to April 15) at Timbercrest Girl Scout Camp. While cross country is a sport that requires only requires minimal equipment and basic coordination, it’s a great idea to hire an experienced guide listed here who knows the areal, as well as to consider starting with a lesson if you are new to cross country skiing. Find trails, event schedules, and other wilderness enthusiasts through the Montana Wilderness Association. Ski information for Glacier National Park and the surrounding area.